Today I was reminded what color my desk at work is because finally I can see the top of it. I am master of my desk again, at least for the time being. I went through all the stacks of papers and organized everything, putting things in their rightful place. The rightful place for a significant portion of these papers was the trash can. All these papers I had saved up, thinking I would get to them later or else that they would be of use to me in some manner but seeing as how they sat there so long without paying rent what was the point in keeping them? I need to remember to ask myself, am I ever really going to use it? If the answer is anything less than an unqualified yes, then out it goes. I feel soooo much better now with a clean desk. I feel so much better now that I can see its surface and know what color it is. Haha, that's pretty bad, isn't it? The person in the YouTube below must have just cleaned off all the junk on her piano because she looks like she feels better, too. She's saying to herself as she plays, "I am soooo glad I got rid of all that stuff on top of the piano and now I can open up the lid again." It's a pretty cool gadget. You actually do the programming for it on the computer via a USB cable hookup, unlike other universal remotes. I didn't even know such a thing existed although the idea makes perfect sense to me. 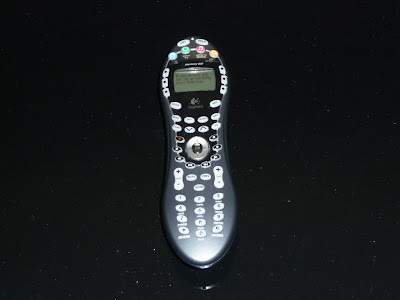 The other thing this does that most other remotes don't do is perform a sequence of tasks. For example, you can tell it to play a DVD. That normally involves turning on the television, the DVD player and the audio/visual receiver, and setting them to the proper inputs. Instead of pressing several buttons to make this happen, this Logitech Harmony remote is supposed to do it all with the press of one button, one time. So has it worked? 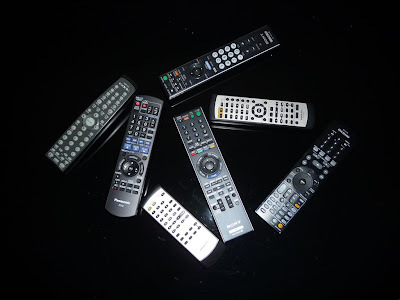 Are all the other remotes obsolete? Nope. Not yet, at least. There are some bugs I need to iron out since it doesn't do everything exactly like I would like it to do. But I am pretty sure I can get it to do so if I play around a little more. I'm intrigued by just how precise I can get the commands. I spent a good part of the day cleaning up the stacks of stuff that have accumulated in Greg's room and I'm still not finished but it is a lot less crowded now! By the way, none of it is Greg's stuff (well actually some of it is but that's in the closet waiting in case he ever wants it); the vast majority are things I've been stacking up since there's no room anywhere else in the house. There's plenty of stuff bound for donation to Goodwill or the Salvation Army - mainly books and some clothes. I thought about the last time I went through everything and why I decided to keep the things that just sat there undisturbed until today and concluded if something has sat undisturbed for that length of time, I'm never going to use it. Or read it. Or wear it. So this time, into the donation pile it went. The books that remain are those that I think (today) may in the future prove "useful." Or that I will actually get around to reading. In the closet are the clothes I think that one day I may actually wear. And in the boxes on the floor in the closet are tons of spare computer parts - how did I collect all these cables and adapters and cards and stuff??? That's it until the next round. Meanwhile I'm looking at the donation pile wondering how it is all going to fit in the car..
Saturday we took a day trip up to Lancaster for their Poppy Festival. Even though it was 75 miles from our house, it was worth it. Besides, even if it wasn't, it turns out the Lancaster Costco is only a block away from the festival so it wouldn't have been a total loss. What I marveled at before even reaching our destination was that the entire length of Highway 14, from where it begins at the Golden State Freeway (5) all the way to the Avenue L exit, had a carpool lane. A carpool lane that far out to the wide-open spaces? Well I guess there are tons of people living out that way who commute into the big city and that number is constantly growing. It was a gorgeous day for a festival. Very, very windy but absolutely clear and mild, much better than it would have been earlier in the week with its 90+ degree temperatures. We arrived right before it opened at 10:00. As you might expect at one of these things, there were plenty of booths staffed by people who wanted to make some money. 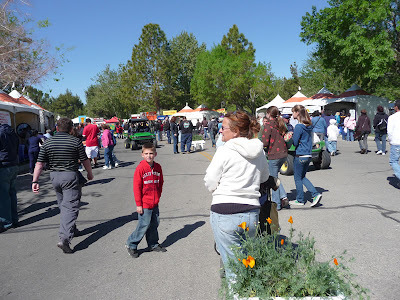 Lots of arts and crafts, plenty of food and also sponsor booths that were giving away lots of knick knacks. Julie insists she is going to use all the useless stuff we brought back in our bags but I know she won't. We went to the Strawberry Festival in Oxnard a few years ago and this one has it beat hands down. 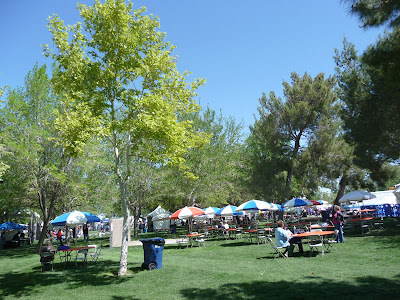 More vendors, better food, nicer surroundings. Going on vacation (even if only for a day) means spending money on things you wouldn't ordinarily spend it on and this was no exception. 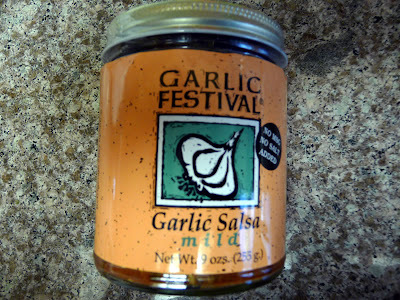 We came back with a 12 ounce package of spinach/garlic linguine that cost $6.00 (the memory cell holding the fact that pasta at Trader Joe's goes for 79 cents for 16 ounces got blocked), a small jar of garlic salsa for $5.00, and a collection of balsamic vinegars and dipping sauce for $54.00. 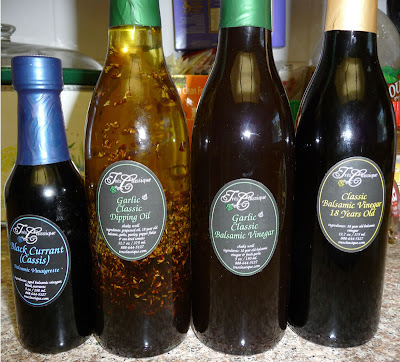 But what a bargain - you buy three of the larger bottles and get a small one for free. Yup, normal shopping sensibilities fly out the door when on vacation! Plus if you take into account the value of the free stuff we got today, that must be worth nearly a dollar so it isn't as bad as I thought. Actually, Julie won a coupon for a free bag of cookies from Souplantation so that's a pretty decent prize. After leaving the festival, guess where we went? Literally only a block away, we couldn't very well come home without seeing what Costco was like in Lancaster, right? The second thing I marveled at today was how many empty spaces there were in the parking lot. It was an awfully big lot, but it seems to me that on a Saturday afternoon, no matter how large a parking lot there is at a Costco, it is filled. The inventory at this location was pretty similar to the one in Azusa. There were lots of food samples being given out and unlike Azusa or Alhambra, not a lot of people standing around with their hands out while simultaneously blocking the aisles. 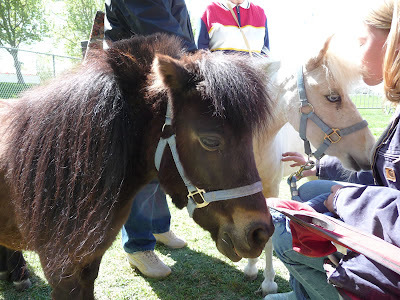 In fact, at the Festival and at Costco people seemed downright friendly. Thank you for your e-mail regarding your visit to Jack #3516. Jack in the Box has a very high guest service and food quality standards and it is important for us to hear from our guests when these standards are not being met. I apologize for the problems you experienced and have addressed your concerns with the appropriate restaurant management. I would be happy to send you a complimentary certificate, which you can use at any of our participating locations. If this is acceptable, please provide your mailing/postal address. If you like to discuss this matter further, please contact out Guest Relations department at 1-800-955-5225, option 1, and refer to report #228329. Our representatives are available Monday through Friday, 7am to 4pm PT. Now how's that for service? I believe when you send a communication to a company that you should receive a timely response, yet I must admit that I am still surprised when that actually happens. JITB deserves a thumbs up for timeliness. I can imagine poor Amber had to wait for Jack to sign the authorization for my compensatory hearty breakfast. I replied with my address and now I am just waiting for my valuable caloric coupon. That's it..
Today's YouTube has nothing to do with Jack in the Box. I thought this was an interesting arrangement of the song. Talk about overkill.. Previously I mentioned my disappointing visit to Jack in the Box on Saturday during which I ordered a hearty breakfast bowl and what I got looked absolutely nothing like the menu board picture. I sent an e-mail to their guest relations telling them about my experience and asking if that was how the bowl was supposed to look. A fairly quick response letting me know that they will address the matter with the offending location came back to me. They still didn't answer my question about the product's appearance, so I asked again. Once again the response came fairly quickly and this person (it's a different jack or jackess every time) told me that the ingredients are supposed to be mixed, not separated like mine were. I am not trying to be greedy or anything but under the circumstances I feel it would be appropriate to receive a coupon for another hearty breakfast since the one I got was obviously not prepared properly. Now the ball is in their court again. Whaddaya think? Will they send me a coupon? Not a whole lot happened today (Saturday)... that's GOOD!!! I started out the traditional way with a trip to Costco, armed with some coupons that came in the mail a few days ago. Coupons = spend more money. 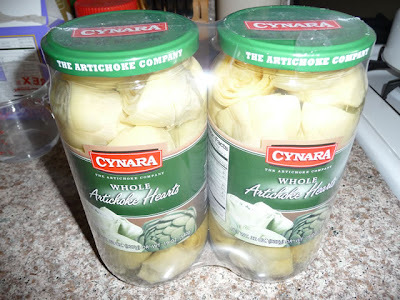 Artichoke hearts packed in water. The only artichoke hearts in jars I ever see are packed in oil which makes them more caloric but I found these that are in water instead. 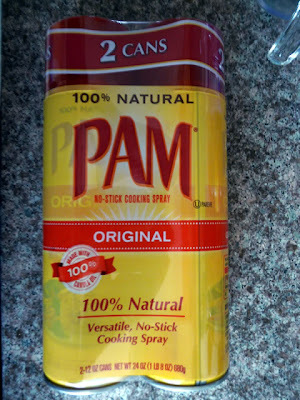 There was a coupon for Pam so I got this twin-pack which will probably last for 30 years. 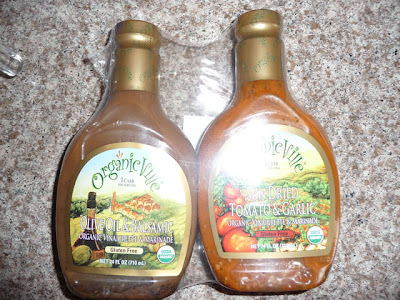 I bought this duo of dressings before and then it disappeared. Both of these are really good so I got two packs of them since at Costco one day something is there and the next day it isn't. And a giant bag of fishsticks. 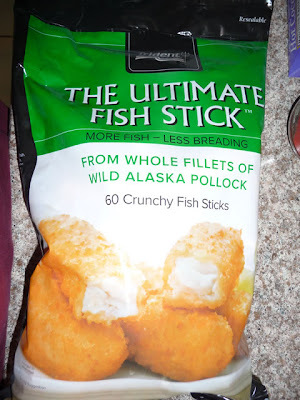 I know, not as healthy as eating non-breaded fish but how can you resist fishsticks? I used to love them as a kid - especially cold. Does that sound weird? I also like to eat them with a sauce mix of mayo and shoyu. Mmmm.. One serving is defined as three sticks. Are they crazy?? 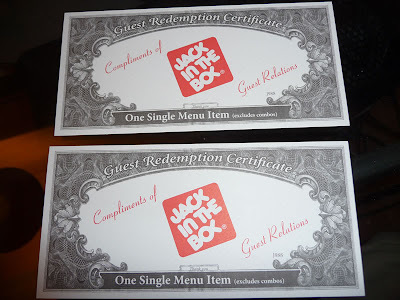 We went to Jack in the Box for lunch. Every time we go I am always looking at the picture of the breakfast bowl and thinking it looks so good, so today I ordered a breakfast bowl combo. What arrived was a bowl that looked smaller than the picture, and all of the ingredients were separate. Some eggs on one side, a bunch of hash brown fingers in another section, and then some crumbled sausage sitting in a white sauce in the third part of the triangle. Not very appetizing. On top of that it comes with hash browns, which are more of the hash brown fingers that take up the majority of the bowl. I was potatoboy today. I won't even tell you what happens if you click on the "nutritional info" button. I should have stuck with my usual tacos. Even if I have no idea what is inside of them at least I know what to expect. I sent Jack a message via his website so let's see what happens.. Despite a bit of disappointment at Jack, I have nothing to complain about. At least today was a relaxing day! Oh boy am I glad the weekend is finally here. This has been one crazy week at work! I drove home on a freeway more crowded than usual, feeling deflated and drained, telling myself hey, this is the weekend so cheer up and get energized. Then I looked at the mail. There was an envelope from my long-time good buddy Michael Jones. That cheered me up right away. I opened it and the contents gave me a big smile. And here's a picture of me. I'll let you guess which one I am. 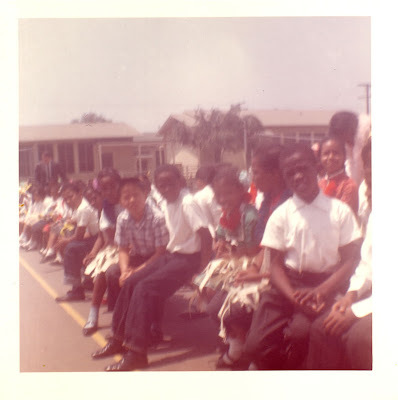 I remember a few of the kids in the picture but not their names. I remember that shirt I'm wearing, too. I always thought I looked like Sargent Carter in the old Gomer Pyle televsion series. He also sent a letter (unbelievable, someone actually communicating with me via regular mail) and a copy of the poem I mentioned in my post about our reunion lunch. I think it's a great poem but sorry, I'm not going to print it here since it is his work, not mine. Good ol' 36th Street School. I still have dreams about it at times. Back then the play yard seemed soooo big. Anyway, I'll reiterate how I am so glad it is the weekend. And this particular one has no real commitments to it. That's the best kind, wouldn't you agree? I feel like the YouTube video for today - joyous. I love Carole King - there is such an expression of joy when she sings. I know it is actually Friday when this post appears but I am writing it on Thursday. Today was pretty boring - just the usual work headaches that make me keep telling myself to work on my five-year plan. But I did get something in my e-mail inbox that I thought I would share with you. 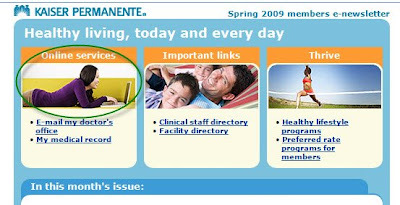 I looked at the picture (I circled it in green) and thought, hey they are using Nadya Suleman, the octupletress in their newsletter! Don't you think that looks like her? But then where are her 24 kids? They're probably playing in the refrigerator or something while she's busy checking out new home prices on the web. The only other thing to comment on today is how annoying the dogs next door are. Yes, dogs, as in plural. Apparently they have a guest dog and when it barks, it sounds like it has an accordian or a pan flute caught in its throat. Or both. And it's very loud, to boot. Well I have to admit that I am kind of enjoying Facebook and actually have some friends on there now. More than in real life, haha.. The other day there was an enigmatic post from one of my friends: "olpr" is all it said. Hmm.. olpr.. olpr.. what does that stand for? I sat there thinking I wasn't very hip and everyone else knew what she was talking about. Then someone else commented on her post and said to excuse her ignorance, but what did that mean? O = on and L = line? But what does the P and R stand for? The next day she had another post. Her two-year-old daughter had gotten hold of her I Phone and was playing with the keypad. She said she was glad she hadn't typed anything offensive. Now that's a real LOL! And here we all sat, trying to read meaning into that mysterious message.. 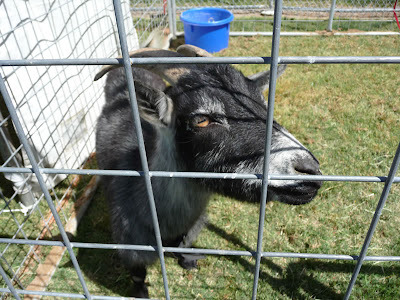 I found out that one of my co-workers went to Las Vegas last Friday to visit a childhood friend who was in jail. The reason his friend was in jail was because he murdered his wife. The reason he murdered his wife was because she talked too much and wouldn't shut up. I thought that was kind of funny in a sick sort of way. I know, I have a demented sense of humor. I relayed the story to Julie and then kept looking at her with a grin on my face.. There's a definite difference between the way men talk with each other versus the way women talk. I was thinking of putting up a poll asking the question, "should women be born with a muting button?" but then thought the better of it lest some people take me seriously, haha.. When I mentioned how I was going to get together with my two good buddies from junior high, one of my friends told me that she recently had a mini-reunion lunch with some of her friends that she hadn't seen in ages. She pointed out a difference between guys and girls that I thought was pretty accurate: "..you guys have such a good time just having fun. No drama like women do..."
Yeah, with guys nothing is really a big deal. Or maybe our big deals are just different. After I got back from my lunch with Alan and Michael, and after my lunch with JT, Julie asked me what we talked about and I thought back on it and nothing really stood out. Then she asked me if we talked about this or talked about that, or did they ask this or did they ask that, or did I ask them this or did I ask them that and I just shook my head and said "no, no, no, no, no, no" in response. And she couldnt believe it. "You didn't talk about ____? Or ____???" "No, guys never talk about that stuff. Didn't even come up." "Well then what did you talk about?" I pondered that one and shrugged. "Not a whole lot." "You and your friends are weird." Let's say you get together with your friends and one of them got in a car accident. "You did?? Are you okay?? Did you get hurt? Oh my goodness! I hope everything is all right. Let me know if there's anything I can do for you." "Is your car okay? Was there much damage? Who hit you? A woman? How old was she? Was she fine-looking?" Okay, I'll stop here before I dig myself in deeper..
Michael scanned a few momentos of our Easy Livin' days and e-mailed them to me this past Saturday so I thought I'd share them with you instead of subjecting you to my usual recount of my visit to Costco (although I do have a heads up - if you like those Martha Stewart chicken slab pies, for some reason the Alhambra Costco sells them for $4.97 whereas all the other locations have them for double that amount. Maybe people in Alhambra think the pies have bird flu or something). Let's see... that one would go for about $4,500 on the open market today if in mint condition. As you see, Duane's phone number was changed so this was after high school, when he moved to Pasadena. Notice there was no need to put an area code. 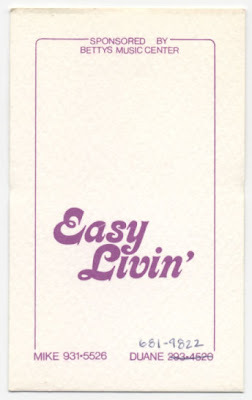 A card in mint condition prior to the number change would list for around $6,000 and the real gem would be our original business card that came in various colors and had everyone's name on them. That would probably fetch $25,000 easily these days. 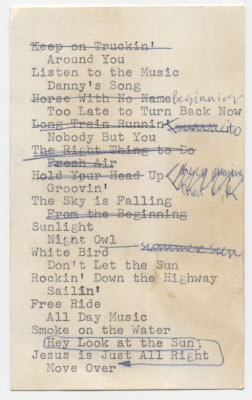 Below are some of our song lists. Normally Michael or me had the dubious honor of making them up. Now just think, back in those days we didn't have computers or copiers or printers so we had to write out five copies each time. Hopefully we adhered to the same order on each copy. Back in those days we also had no digital cameras. I wish we had some pictures or recording but as far as I know, nothing exists. Maybe that was on purpose.. 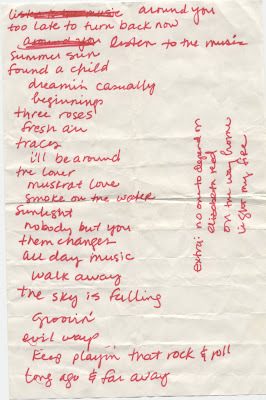 Finally, here is a list of songs that Michael kept. 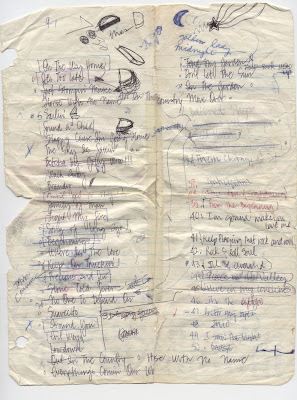 He says this is every song we ever learned and he just kept a running list. 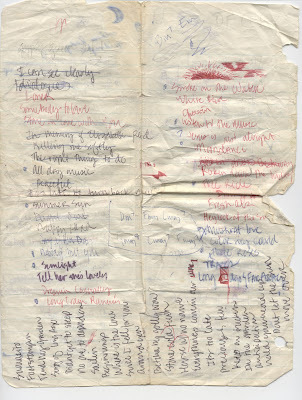 I had forgotten we did some of those but after seeing the list, I could hear us playing the song in my head. Haha, yeah, I hear more than voices. You know, those were really some good times. I'm sitting here with a big smile as I type this. I interrupt my regularly annoying blog posting to take a break therefrom and wish you all a very blessed and happy Easter! I checked my e-mail today and sitting in the inbox was a message from Facebook with the subject: Michael Kosaka sent you a message on Facebook. Whoa! I hadn't heard from him since, well since a long, long time ago like sometime in the late 70's. If you have read my earlier blog posts, you know that Michael was our bass player back in our Easy Livin' days. Getting back together with two of my best buddies from long ago, Alan and Michael Jones, then having lunch with JT yesterday and now hearing from Michael today.. not to mention recently hearing from a couple of other folks from the past, Ruben and Brien.. what's next? I'm elated. It's good to hear from people! Did me, mister anti-social actually just write that? Well even Ebenezer Scrooge had a change of heart.. So I guess being a Facebook member is worth it - if not for the inane messages we all post, definitely for the getting-in-touch aspect. You know what I miss? How Michael and I would frequently drive out to Johnnie's Pastrami for lunch on a Saturday or Sunday. If it was a Sunday, we'd discuss the previous night's episode of Saturday Night Live. Or act like we were two wild and crazy guys. Then we gradually lost touch with each other. Last I'd heard, he had moved up north and became a video game designer guru. After I write this, I'm going to send him a longer reply than the first one, when I got the initial e-mail. Hey, I thought I'd give a shout and reach out to you about something that I hope we can wrap our arms around. What's with that kind of talk??? I've noticed more and more lately that too many people are talking that way. Reach out.. I'm reaching out to you. Let's have her reach out to him and take ownership of the matter. Let me wrap my arms around it. To me, listening to people talk that way is the same as sitting in a group of unfamiliar faces having to listen to the song "Getting to Know You." I think that would make for a good Seinfeld episode, though! I felt totally worn out when I got home from work today. But I still forced myself to observe routine and do my normal run in keeping with my OCD that I have to do daily exercise or else. Wouldn't it be nice to be able to have a schedule that aligned with how you were feeling? Like if you wanted to sleep, you sleep. Work when you felt energetic enough to do so effectively. If that meant at 3 in the morning one time and then at 4 in the afternoon the next time, so be it. Today for example - what if I just went to sleep right after work. Not for a short nap, but went to sleep like I normally do later at night, and just slept until I woke up. Then when I'm up, eat dinner at whatever odd time that might be, then do some work. Would that be strange or would that be more efficient? I was thinking for most jobs that's totally impractical but for something like making a living from writing stories, that's totally efficient. Write when you are energized, when you feel like you have something to actually commit to print - when the inspiration hits. Out of synch with the world moving through its typical day but in synch with what works for ones own self. Like you are used to me doing, today I am going to complain about a couple of things that really bug me. First thing has to do with an article that was in the Saturday edition of the Wall Street Journal. The title of the article is The Scariest Monster of All Sues for Trademark Infringement. The "scariest monster" to which the article refers is Monster Cable, the company that makes overpriced snake oil cables that unsuspecting people are duped into paying outrageous prices for because they think somehow their cables are better than other cables even though there is no difference in sound between them. The first example used in the article is how Monster Cable sued a couple who owned the Monster Mini-Golf franchise, demanding they surrender their name and pay Monster $80,000 for the right to use this name. Ridiculous, you say? Yes it is, but that hasn't stopped them from bringing numerous suits, including one against Disney for the movie "Monsters, Inc."
Have we all gone nuts? I think so. All these companies that get sued must feel like a battered Rodney King pleading, Can't we all just get along? Except the companies legitimately using the generic word "Monster" are innocent. To my limited readership: I IMPLORE YOU, please NEVER EVER buy a Monster Cable product again and urge your friends and family to do likewise. You are just wasting your money buying products made by them as well as contributing to their litigious team of turkeys bringing frivolous suits left and right. This has got to end. Now you know why Monster Cables are so expensive. You have to pay for huge legal fees. It surely has nothing to do with the quality of the product. So PLEASE let your conscience be your guide and don't support an unethical thug like Monster. I am serious. 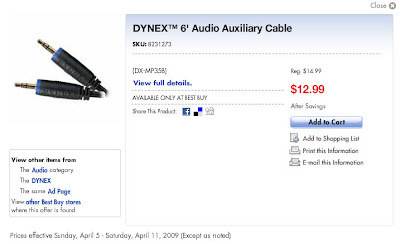 Ooh, fancy name: "Audio Auxiliary Cable." This is nothing more than a cheap 3.5 mm connecting cord for things like Ipods, MP3's, portable CD players, etc. Notice how it says it is exclusive to Best Buy. Good, let's keep it that way. Here is a cord that does the exact same thing and while the build quality may be different (better or worse, I dunno), you will not be able to hear any difference in sound between the two. Plus, since you can buy more than 20 of these for the price of the Dynex, if one breaks you can just toss it and pull the next one out of the bag. This comes from the Monoprice.com site, well known for decent cables at decent prices. 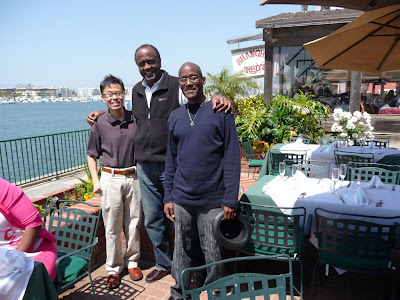 I think we've all gone crazy lately..
Today (Saturday) after forty years, I had lunch with two of my best friends from junior high. Today was all grins! Michael, Alan and John Jones were my three best friends in junior high. Today I got to see Michael and Alan. I've known Michael since elementary school, where he was my best buddy. Then we met Alan at Foshay, a school where my boss says they sent all the "bad" kids from the school he attended (John Burroughs junior high). Seeing them today was great; we just scratched the surface catching up on things so I hope we can get together again soon. Michael told me that over the years he's been wondering whatever happened to me. Last Easter, he said he was at the Albertson's at Rodeo and La Brea when he had a feeling that someone he saw there was me. This guy didn't look like me; he said he had a full head of gray hair in a Beatles-style cut but Mike had a sneaking suspicion it was me; he stood there wondering what did I do to myself. But he didn't have the nerve to go up to the guy and ask if it was me. I told him, "nope, that wasn't me." He laughed and said now that he was looking at me, he recognized the real me, but back a year ago for some reason he kept thinking the person he was eyeing in the store was his old buddy. Then he pulled out a piece of paper from an envelope and handed it to me. 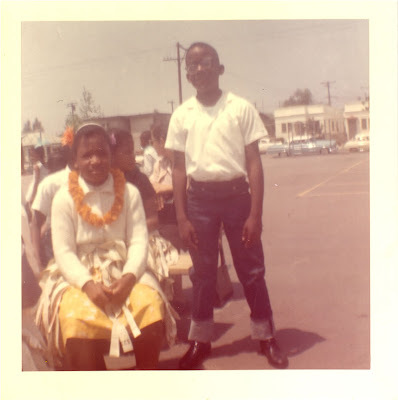 He had written a poem shortly after that about his experience - about him wondering if that person was really me and how I had changed so much over the years from the days when he'd come over and my mom would give us Carnation ice cream sandwiches. And he wrote about how we were now older than our parents were at that time. That's something I've often thought about - that we are now at an age older than our parents when we used to go to each other's houses. It was a really nice poem. I handed it back to him but you know, I should have asked him if it was a copy I could keep. As I drove home I thought about how Michael had wondered about me all these years. From my point of view, I have trouble believing that the people I knew from the past still have such a curiosity about me, even though I have a big curiosity about them. Me, I wonder if anyone even remembers me. It's just like I think back on all the girls I had a crush on, but it is difficult for me to entertain the idea that there may have been girls who had a crush on me. Well, maybe there weren't any. But if there were, it's hard for me to fathom that. One funny thing - the first person that Mike asked if I had seen or heard from was Hironobu Mori. I told him no, I hadn't seen him since junior high but I keep in touch with someone whose brother is married to his sister, Masayo. Then Mike smiled and said "I remember her. She was really good looking." I laughed and told him about my recent lunch with JT, who also held the same opinion about her back in those days, and who still remembered her (and declared her as being "fine"). As we walked inside to the buffet tables, I told Mike, "there were lots of fine girls at Foshay, weren't there." Mike smiled and nodded. "Yup, there sure were." Saturday was good. Here's a picture of us old folks (click on it to enlarge). That's Alan in the middle (he's 6' 4"). We all agreed we were blessed to be healthy, happy and employed. I hope to see them both again soon. We ended up going to different high schools and I drifted apart and lost contact with them up until just recently when I got in touch with Alan. In high school I had a different set of best buddies. In both cases, I've been really blessed to have such good friends in junior high and high school - you couldn't ask for better ones. Here's something from 40 years ago..
Not much to say but you know that doesn't stop me. Today I'd like to share with you a topic I found on one of the audio forums that I read. It is a discussion on what is the best way to stop a phonograph record on a turntable. I'm not sure if they are serious or having April Fool's day fun but if they are serious, well, come to your own conclusions. In my younger days I would play records using the point of a compass. I have also used a Bic pen with success, plus you can see the ink it leaves in the record grooves. Another subject: there will be no Costco report tomorrow since we went tonight instead. No new products to report. We went to the Alhambra Costco this time since we were in the area and after going there it served to reinforce my preference for my usual Azusa location. The reason for going tonight? Because tomorrow (i.e., Saturday, which is actually today since I am writing this yesterday) I'm meeting my old junior high buddies Alan and Michael for lunch! Wow, hard to believe. I'll let you know how that goes. Okay, today is rant post. The big news on Wall Street today was that the Accounting Standards Board caved in and is going to allow bankers to weasel out of having to do a "mark-to-market" on their bad assets. Oh how boring, what is all this stupid accounting lingo he's talking today?? You might well ask. Well, it is something you ought to know, just so's you know how deceptive your smiling banker really is. "Mark-to-market" refers to the practice of valuing assets at the lower of cost or market. In other words, it means that if you have an asset, let's say a house, for example, for which you paid $500,000 two years ago and now it is only worth $40,000 and its picture is on one of those infomercials that tells you how to make a fortune buying foreclosure properties, then when you list the value of your assets you have to say it is worth $40,000 (what it is worth today), rather than $500,000 (what you actually paid for it). That way, someone gets a true picture of how much your assets are really worth. Does it make sense to say you own a $500,000 house if you can only get $40,000 for it if you sold it today? But that's what banks are now going to be allowed to do. No longer will they have to declare the "true" value of their distressed properties and other impaired assets, but they will be able to estimate what they think it is worth and declare that as the value. That's just like if I have a brand-new $30,000 car that gets totaled by a bus, I keep going around telling people I have a $30,000 car. Well, let's get realistic. I know it got into a little fender bender so I admit to you that it really is worth more like $26,000. But in reality, the car is only worth its scrap metal value. I can say whatever I want but the inescapable truth is, no matter what I call my car or how I describe it, it is really a piece of scrap metal. That's analogous to the bad assets that have infested the banks. A bad asset is a bad asset, but now the Accounting Standards Board has given them their blessings to tell you that a rose is not a rose. And that's something you should know. Just like people who spell their names one way but pronounce it another, the banks have got a lot of junk that they're not going to tell you about. Somehow they think that makes it go away. What's that saying? If it looks like a duck and sounds like a duck and walks like a duck.. a bad asset is a bad asset.. a kiss is just a kiss.. a sigh is just a sigh..
My sister called me after work and asked me what I was going to do about the big virus that was due to infect computers all over the globe on April 1. "What virus?" I asked her. "Is this some April Fool's joke?" "Haven't you heard it on the news? They've been talking about it all day." She proceeded to tell me how this particular computer virus had all of the IT people at her workplace up in arms, working on preventative measures all day. Then she asked me, "Should I unplug my computer?" "Unplug your computer?? What for?" "I heard that the virus will get into your computer even if it is turned off." "Someone told me that a while ago." I get so annoyed when misinformation like this gets passed around, and even moreso when people believe something that makes no sense. "How can anything get into your computer if it is turned off?" I asked her. "Well I don't know, that's what I heard." "They don't know what they're talking about!!" I also get agitated, haha.. "A virus has to get processed in order to work and if your processor isn't on, nothing can happen. Even if it is on, just don't click on anything you shouldn't click on." I don't think she believed me. I'm sure that after we hung up she went and unplugged her computer. What people should do is send around a helpful e-mail telling everyone if they really want to be sure, then unplug everything in the house and switch off their fuses. Make sure their doors and windows are closed and locked, too. And spray Windex on everything. After talking with my sister, I did check out the internet to see what the scoop was about the virus and discovered that indeed it has done some damage. But like Y2K and the worry over the 1984 Los Angeles Olympics, it has been exaggerated beyond all reason.